TCN Channel Nine Sydney. 1965. LP (OP)	HMV. OCSD-7655. 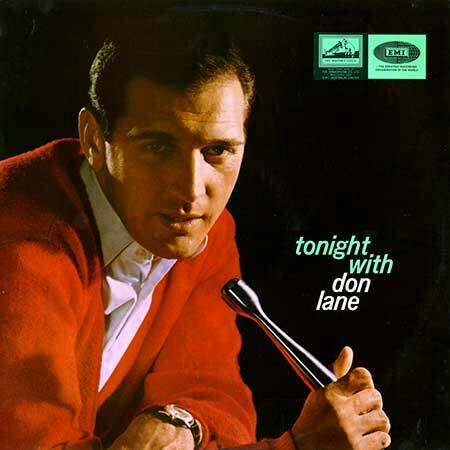 “TONIGHT WITH DON LANE”. Arrangements and Musical Direction - Geoff Harvey. Let Me Sing And I’m Happy. (1:54). This Is All I Ask. (4:10). You Must Have Been A Beautiful Baby. (1:48). In The Wee Small Hours Of The Morning. (3:22). Jamaica Farewell (Kingston Town). (2:35). (Lord Burgess). With George Golla, guitar. (Chappell). My Kind Of Girl. (2:58). (Kahn - Erdman - Meyer - Schoebel). (Davis). I Wish You Love. (4:20). (Borek - Nutter - Guion). (Davis). (Segal - Danzig). With George Golla, guitar. (Davis). Lovely Way To Spend An Evening. (3:12).